Slovene (or Slovenian) is a language. It is the official language of Slovenia. 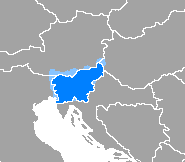 More than two million people speak Slovene. It is a Slavic language, written for more than 1000 years. It is one of the official languages in the EU. The alphabet is almost like the English alphabet. Nìč  is the word for zero. Ena is the word for one. ↑ Nìč sounds like nitch in English. The Č in nič is a special letter of the Slovene alphabet. Other special letters are Š and Ž.